Heidi and Seek and Ethical Fashion: Brooch giveaway! My process for making clothing is quite freeform. I first pick out fabrics that complement each other. Sometimes I have a basic idea, which I cut out the pieces for. Then I lay the pieces together to see what looks good. Often it ends up completely different to what I originally had in mind, because I might change my mind during the sewing, too. With reconstructions, I usually try the item on, then test the look of fabrics by pinning them together until I come up with something I like. 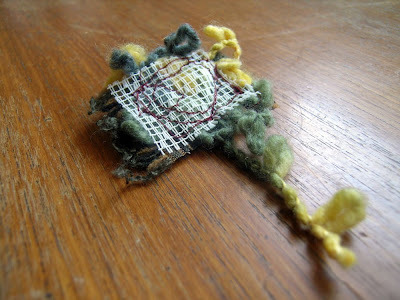 This is the method I used to make the brooches, but it didn't work out as well as I hoped. As often happens with me, I am less impressed with my work the next time I take a close look at it. Out of the eight brooches I made, there are only two that I like enough to present for this giveaway. I'm going to take a different approach in future - I'll sketch ideas first and then create the ones I like. Click the images for a larger picture. 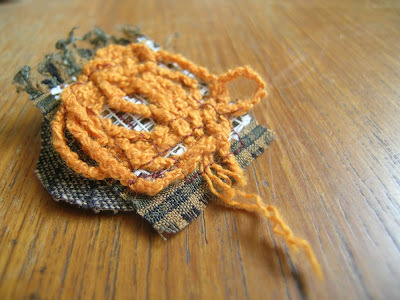 These brooches were made from fabric scraps and second-hand yarn. Just comment with your opinion of them, your favourite and your email address to win the one you like best. I'll randomly select the winner in a weeks time. Why did I not know about your blog?! I just saw your post in the promo section of the madeit forum... a giveaway is a great idea! And very generous of you. I actually love both brooches for different reasons. I love the tangerine disaster one because the colours in the yarn are gorgeous, and I love the heart flower one because it has a fabulous shape. My favorite is the Tangerine Disaster...both are equally awesome and your creativity shines through in them!! I like the tangerine one, the fabric on it is really lovely. I've added your blog to my blog roll as well. It needed a big update, I had not changed it in about a year. Now yours is at the top! I like the heart flower one. I have a thing for anything to do with hearts, and I really like the green/yellow colours.